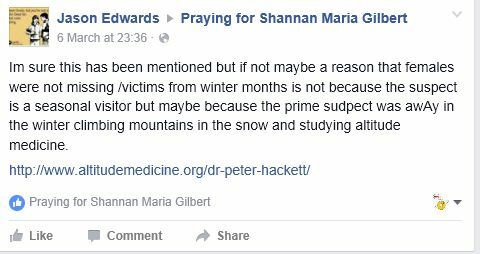 So back at the beginning of March something was posted on the “Praying For Shannan Maria Gilbert” Facebook page that really had me troubled. I kept going back to it to see if anyone else would correct it or at least question it, because it was just so far from right. We’ll get to that at the end of this post. Damn, that was almost a year ago. I almost thought we had heard the last from Fluke here at ZW. Nope… he has returned and his comment (as usual) also… so far from right. 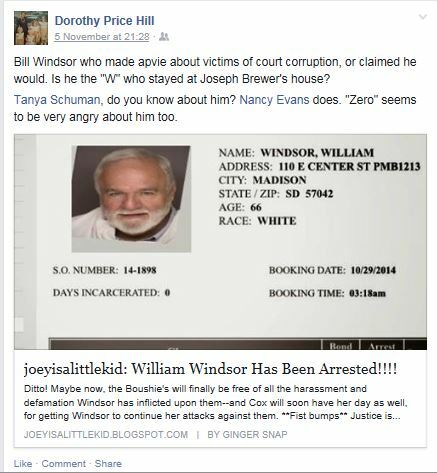 We’ll get to Fluke and his comment right before we get to what was left on the SMG Facebook page, and in the end you’ll see how it all fits together… but first let’s discuss how far from right Dorothy’s comment on Bill Windsor’s Facebook was. Yes, Dorothy left a new message on Bill’s FB. It happened in the middle of the month, sandwiched in between the SMG FB comment and Fluke’s comment here. The far from right sandwich. Whose hungry? WTF?!? 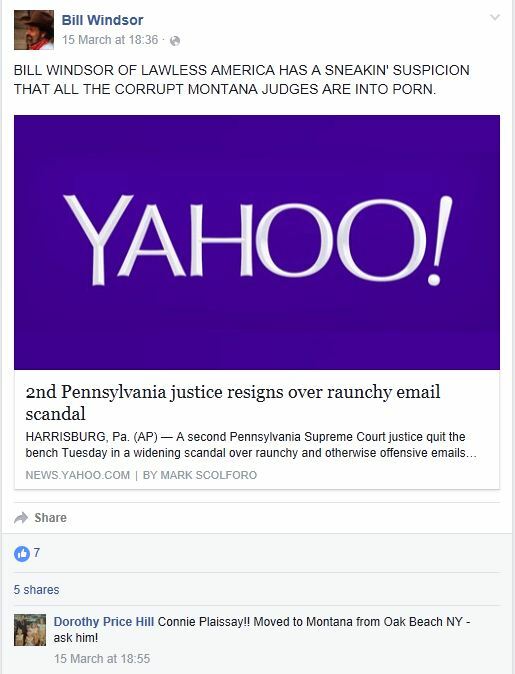 Anyone who follows the Lawless America saga (saga seems to be the new “it” word for my posts) knows of Bill’s ongoing tales of court corruptions and hatred for Montana. But what does Connie Plaissay have to do with any of Bill’s crap? Again, Cristin (MM7) and Michelle McKee (and RadioNewz, though as parody I’m sure) brought Murt into the LISK case via MM7’s drone stalker and it should have been called out by anyone, everyone involved in any of it. I think I was the only one to call it out. Cristin never admitted Murt was not involved, McKee won’t even acknowledge her part in it, and RadioNewz never explained their satire posts about it did not in any way truly link Murt to LISK. In fact they all probably loved it. And as I have said before, this led to people saying Murt was Morrie (Morrie is CCC stuff, I promise we are getting to a CCC post very, very soon, but all this must be said first) and a post on Murt in the Shannan Gilbert blog (again showing Cristin’s influence on Mari at the time). Is this fun and games or are people wanting misinformation out there on the LISK case? I seriously question this now, and maybe a few of you will by the end of this post. So just how Cristin brought all the craziness from Murt, McKee, and Radio over to the LISK case… Dorothy keeps trying to bring the LISK case over to Bill and his Lemmings (in Nancy’s case, she did just that). Why is she even commenting there any more? Didn’t she accuse Bill of being linked to LISK and the Drifter? Yes. There is Dorothy trying to bring the LISK case directly into Bill W’s lap. LOL at my mention. I seem to be angry with everybody… right? Key word is “seem”. I’m not mad at Bill, though the ones involved in these types of internet feuds that take it to the level of lawsuits really are a lowly breed (you all know who you are). Point is, Bill or someone should have caught on to Dorothy’s crap and blocked her from commenting on his stuff. Get the theme here yet?No? Well let’s start from the top then. There we go… Fluke gives out names to Dorothy to drop in vague and cryptic comments all over the web, but he saves his favorites for himself. Junior has a beef with all his old neighbors, but man he really hates the Cannings . What ever his real issues with all of his old neighbors are, the association trying to kick his family out or his neighbors involved with extra marital affairs, possibly involving his mother (damn, I said I wasn’t gonna bring the rumors up), he seems to hold the Cannings’ most responsible. 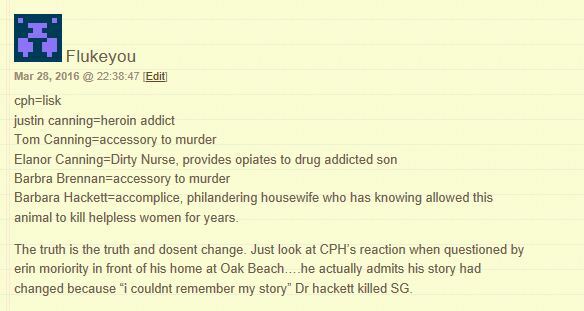 Which to me (though I’m no psychiatrist) is why he makes them the most responsible with holding back information in his tale of Oak Beach corruption and murder. Enough psycho mumbo jumbo, let’s simplify it. I have always said Dr. Hackett is and should still be on the radar of anyone who looks at this case or anyone involved in this case. There are many reasons in my opinion to feel this way, most recently the stuff that has come out on James Burke. 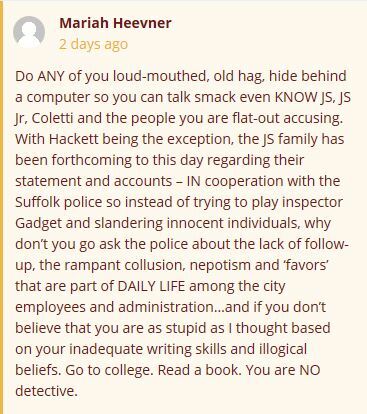 After all, wasn’t Hackett the former director of Suffolk County emergency services? I still feel he is a strong suspect. But as I have said before, Flukeyou, Dorothy, and others only made me less suspicious of the Doc after seeing the lies and games they got out there early on in all this. And even though Cristin and even Nancy were smart enough to get away from the lies and misinformation that has come from you all getting together, Dorothy and Fluke keep it going to this day (as their recent comments show). Fluke (and I hope you are reading this), if you just wanted to say CPH=LISK, and explain all the reasons you think it’s him, that would be one thing. But to get crazy women on the internet to help you in smearing every one of your neighbors is down right psychotic. Even if you really thought some of your neighbors were hiding something, the personal attacks would not be necessary. You have deep-rooted issues that have created this obsessive hatred for those you once called neighbors. More psycho mumbo jumbo… pointless, you guys aren’t gonna see what you do. And it seems you aren’t gonna stop what you do. But why is the misinformation and straight out lies not confronted more? (How many times have I asked that question?) Other than here, that is (yea, that’s for the haters). If you can’t trust LE for the right information, who can you trust? When everyone on the internet is chasing the same misinformation, who can you trust? When even the families of victims and those close to the case are taken in by misinformation, who can you trust? Who can you get the right information from? And more importantly, is it so tainted that no one has the right information to work on? Is everybody that far from right that a tragedy is badly being misrepresented and misguided, leading it to remain unsolved? And that’s just one example of the many in the pages of this and my LISK Blog. Everyone involved in allowing it, even me. Yea, but at least I’m trying to call it all out (again, for my haters, though I don’t know why, most never make it this far in a post if they even read them at all). I keep calling it out because I don’t understand it. Do any of you really think you are helping? Fluke? Dorothy? Jen? Anyone? I know I’m not. And I really do try to. Yes, even though I lost faith in the “saving the world” via internet long ago, I still try to help point out the lies, agenda, and just plain misinformation out there on the LISK case. I have grown close to the case and would like to see it solved and the victims and all that knew them to see justice and have some kind of closure. Yes, I try to help, but sadly I know that this blog is not in the position to do so. If I can see that, I would think those of you so obviously doing your best to spread bad information must know you are not helping. Right? And everyone who helps it spread or just let’s it sit without any attempt to set it right… well you know you are not helping, right? I know I don’t have to point out to anyone here that the Dr. Peter Hackett in that link, the Dr. Hackett who is said to be a world-renowned high altitude expert and altitude research pioneer as well as former Rolling Stones physician is not the same Dr. Hackett who was neighbors with Flukeyou and involved in the LISK case. But I guess no one looking at the SMG FB could tell the difference, or if they did no one corrected it. I almost did, but I wanted to see if anyone else would, plus I don’t like posting there. I just wish it didn’t let so much misinformation out there in a place where people go to look for real information and pay respect to Shannan. I would hope those running the page know that is not the same Dr. Hackett. But closer look shows that the page is actually the only one to “LIKE” what Jason Edwards had to say. So I don’t know. Is this done on purpose? Again I ask, does anyone truly want to help solve this case? Because this does not help. And how about the Dr. in Colorado? Does he deserve to be posted on the memorial of a murdered girl as a possible suspect just because he has the same name as the Oak Beach Doc? I would hope no one would think that was OK. And yet the comment and link still sit there almost a month later, uncorrected, unquestioned, and “LIKED” by the page. Maybe Mr. Edwards really thinks the 2 Docs are the same (Can you imagine the 1 legged Dr. climbing mountains in Colorado?) or maybe he is just someone who likes to spread misinformation and confuse people on the internet (like most of my haters). It’s hard to tell anymore. This kind of stuff has been being put out there 3 years before I started writing about it all, and it still continues 3 years later. So how can anyone get passed all the wrong info out there on this case… when everyone is so far from right?